Enjoy these delicious Crostini crackers in just 15 minutes. 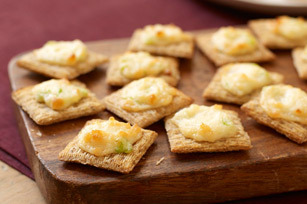 You will only need four ingredients to make these cheesy, tasty Crostini nibbles. Mix mayo, cheese and onions until blended. Spread onto crackers; place in single layer on baking sheet. Bake 4 to 5 min. or until mayo mixture is bubbly and golden brown.